Summary. Extraterrestrial civilizations (ETC) warn that human life is exposed to great danger caused by decreasing of Earth magnetic field and the beginning of global cataclysms. ETC inform that the only way for the continuation of human’ life – a synchronous of civilization consciousness in order to make the Transition to the Highest level of material world where cataclysms will not influence on us. ETC confirm that the action caused by united consciousness will transform our body. That is the main rule of humanity Transition. On the Highest Level of the material world our life will be prolonged in a new cycle. It will be the Correction cycle. 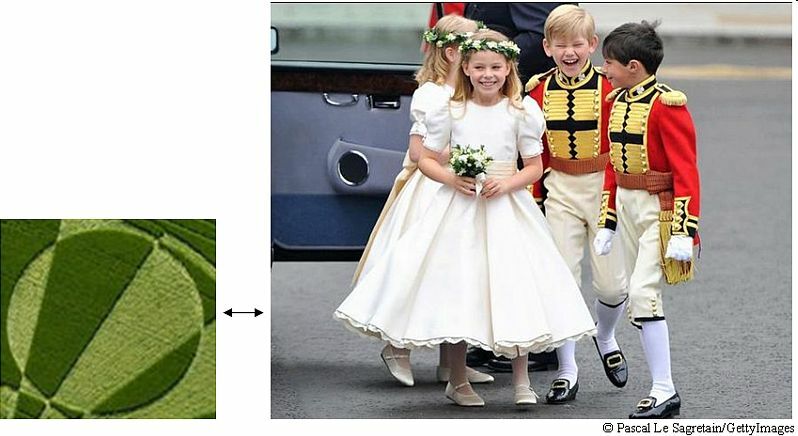 On the picture the large circle is shown. Four circles of different diameter are placed in it. The biggest internal circle covers the centre of the main large circle and touches its borders (fig. 1). In ETC symbols it presenst a brain area of an individual cell shifted to border (fig. 2). Shift is a result of the united consciousness formation. Initial position of a brain area in an individual cell is shown by a small light point in the centre of the picture (fig. 1). Just to this point all dark and light strips going from border to the centre of the cell-circle run together. The symbol of an individual cell is the representation of human being on information level of the Universe. The individual cell of human being is represented by a ring with a small dark circle in the centre. The circle in the centre is a brain area of a cell; a ring – a cell’ border; area between them – a body area of a cell. The structure of an object’ cell is defined by level of its consciousness. Communication of people leads to consciousness unification. According to ETС’ information unification of civilization’ consciousness is a basis for our Transition in the following cycle of life. ETC inform that there is the Principle of the united consciousness :, consciousness unification of two people, i.e. unification of two individual cells leads to formation of the uniform united consciousness cell with expanded brain area. Thus, consciousness unification occurs in the result of association of brain areas of two cells. As a result brain areas of two individual cells unite and one united cell with the expanded area of a brain turns out. It is the united consciousness cell. Unification of brain areas of two cells from a half moon of united consciousness..
Let's return to decoding of the crop circle. The second group of circles consists of a middle size circle and two small circles placed on its both sides (fig. 4). The middle size circle in the centre represents a brain area of the united cell and two small brain areas of individual cells are located from its both sides. So, this way is repeated the Principle of the united consciousness formation. In addition, the Principle of consciousness unification is represented also by the same way throwgh unusual color of the picture. So, two small circles (Fig. 4, red arrows) are equally painted. One half of them is dark colored, and another – light colored. This way extraterrestrial represent two individual cells, each of which is half of the circle. Consciousness unification leads to formation of double size circle. The same way, a large circle (Fig. 4, yellow arrows) captures four lanes - two light and two dark. Each located near a pair - light and dark areas represent two individual cells. Thus, the combined consciousness is formed of two pairs, i.e. four people. The Principle of consciousness unification is several times represented at the background of a huge circle. This way is shown a cell with very thin boundaries (Fig. 5), which emphasize the incredibly extensive brain area which occupies the entire interior of the cell. Thus, the necessity of unification of consciousness of all humanity is presented. Only the simultaneous unification of consciousness 6.8 billion of people will create such a huge expansion of the combined brain area of the cell. So, extraterrestrial civilizations emphasize that only such huge united cell’s brain area will arise an action in a form of laser beam which will destroy our body from the level of global cataclysms. This information about thin boundary of the cell belonging to the unified consciousness of civilization, strengthens also view from the air of the hill fort Liddington (Liddington Castle), located in the county Wiltshire, close to the appeared crop circle. It occupies a large area of 3 ha and belongs to a late Bronze Age and early Iron Age. This hill fort is one of the earliest in Britain and dating to the 7 century BC. View from the air shows that this is an image of the united cell of mankind, since the brain air takes up almost the entire space. Unusual coloring of crop circle with the broken ornament means the symbolic of Earth magnetic field. Extraterrestrial civilizations use a certain color method to highlight a special danger of the state of magnetic field for human life. 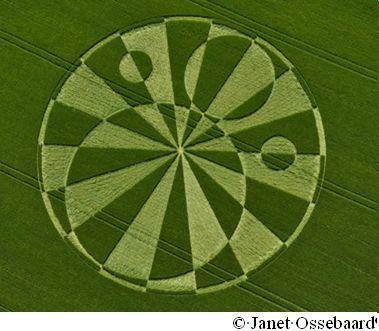 The crop circle with similar symbolic and information has already been presented by ETC on fields. It has arisen on 30th of June, 2008 in a county of Wiltshire, in England. the cell of the united consciousness is shown. It is formed by two individual cells which are attached to its top and bottom (fig. 7). Two small brain areas of individual consciousness cells are shown in right and left peaks of a quadrangular figure (fig. 8). Alternating dark-light rays disperse from them. This way is shown that two people unite consciousness. The magnetic field symbolic intertwined with symbols of mankind’ information cells points on danger for our life from Earth magnetic field. This pictogram also informs about the necessity of our civilization united consciousness formation as the only way for life continuation at approach of global cataclysms caused by reduction of Earth magnetic field. Both presented crop circles contain ETC warning information about critical decreasing of our planet magnetic field and danger of our staying on the planet. ETC began to send messages to mankind about critical condition of Earth magnetic field from 1998, when for the first time an unprecedented ozone hole over Antarctic has arisen. A year later in 2000 this hole has increased even more. ETC have started to transfer to Earth people an annual report of the condition of our planet’ magnetic field. As it is known, the magnetic field of the Earth reminds a dipole (fig. 9). ETC inform that our planet Earth develop on the base of a hysteresis loop (fig. 10). Hysteresis loop has two branches - the magnetization (lower) and demagnetization (upper). ETC confirm that our planet already completed the cycle of magnetization, passed the beak and now is on demagnetization branch of hysteresis loop. Fig. 9 Fig. 10 4 мая 1998 г. Вилтшер, Англия 19 сентября 1998 г. Reducing of planet's magnetic field, observed by scientists, also indicates that the Earth's magnetic field corresponds to the upper branch – demagnetization. The major symbols of danger in ETC messages-warnings are symbols of a magnetic field and a hysteresis loop and its beak. In 1998 ETC have introduced a symbol of hysteresis loop (fig. 10), having designated, thereby, the beginning of a new period in mankind’ life. ETC have pointed that it is the moment when decreasing of Earth magnetic field has reached last critical value before the beginning of global cataclysms. fourth level of human being consciousness. The ETC warning of critical decreasing of Earth magnetic field was revealed in the unprecedented sizes of an ozone hole over Antarctic. The record sizes of ozone hole of 2000 with area of the 29,2 million кm2 have confirmed ETC warning of a dangerous condition of Earth magnetic field. Since 2000 the magnetic field symbolic appears only at its critical changes 1.5-2 months prior to ozone hole disclosing. Tragically, it happened almost annually. In all crop circles ETC symbols of magnetic field are combined with symbols of mankind life – information cells. It shows dependence of mankind’ life from condition of Earth magnetic field. This is the ETC report about Earth magnetic field condition presented in crop circles. 2002. On July, 18th 2002 on fields of England had arisen the crop circle with magnetic field symbolic. Scientists register that ozone hole in September 2002 has divided in two. 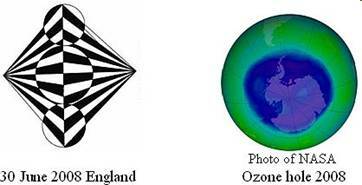 Depth of an ozone hole was 165 DU. 2003. On June, 24th 2003 on fields of England had arisen again a crop circle with magnetic field symbols. Scientists registered that ozone hole’ area reached 25 million кm2. 2004. On August 8 2004 on fields of England ETC again have warned about danger by crop circle with symbolic of magnetic field. Thickness of an ozone hole has reached the minimal value – 99 DU. 2005. The area of ozone hole was 27 million. km2. Thickness of an ozone hole was 110 DU. 2006. ETC informed that Earth magnetic field as if has been torn away from a skeleton. Scientists registered that the ozone hole has broken the second record. The huge size of ozone hole 28.4 million км2 or 11.4 million in sq. miles reached almost joint area of the North America and Argentina. A thickness of an ozone layer was 93 DU. 2007. Area of ozone hole covered 25 million km2. A thickness of an ozone layer was 125 DU. 2008. Area of ozone hole – 10.5 million sq.miles. A thickness of an ozone layer was 107 DU. 2009. The maximum area of ozone hole in 2009 had reached 24 million km2. A thickness of ozone layer – 240 DU. From the scientists point of view the decreasing of ozone layer was not serious. However ETC confirmed absolutely opposite. They presented a huge empty box in crop circle, informing that Earth magnetic field is almost absent. Nevertheless, the mankind continues to live on this planet, deeply assured in its reliability. The presented ETC report of magnetic field condition gives mankind possibility to learn about a menacing condition of our planet magnetic field. This information can not be obtained in accordance with the present level of development of science and technology. The most important that we do not have experience in this process. We never have passed through similar process of the termination of a planet life cycle. We do not have criteria to estimate a condition of Earth magnetic field. The radical changes occurring in Earth magnetic field dramatically reveals in nature. Failure of internal biological compass in the result of magnetic field decreasing leads to loss of orientation and mass destruction of whales, dolphins rushing on coast. The same reason causes destruction of huge flights of thousand birds. The reason of global cataclysms beginning explains the Barkhausen effect (fig. 12 a), which occurs in ferromagnetic materials. It is known that the Earth's core is ferromagnetic. According to the Barkhauzen effect in some areas of both ascending and descending branches of hysteresis loop of ferromagnetic material spontaneous jumps of magnetization arise (fig. 12 b,c). Jumps occur suddenly reaching value of «field of start». In the beginning arise single jumps. Then, their number is growing. Jumps overlap on each other. In the cyclic remagnetization Barkhausen’ jumps form «packages of magnetic noise» (fig. 12 d). Start of Barkhausen’ jumps, the speed of their rise and form of «magnetic noise packages» depends on stuctures of ferromagnetic material. In the soft carbon steels Barkhausen’ jumps occur slowly and sluggishly. In solid stainless steel - the number of jumps increases very rapidly. The Barkhausen effect is widely used for nondestructive testing of ferromagnetic materials’ condition in many branches of industry: aviation, machinery, etc. On macro level of planet Earth these jumps of magnetization correspond to earthquakes, tsunami, flooding and other natural catastrophes fig. 13. ETC confirm that the decreasing of Earth magnetic field has almost reached the «field of start». That is why shortly catastrophes will begin. However, before the start of a global cataclysm three preliminary of incredible strength will happen. We never see such phenomena of nature. In 2007 ETC for the first time in two crop circles in England clearly provide detailed information about three preliminary cataclysms, place of their occurrence, people’ losses in each of them and give us instructions what to do in order to prolong our life. The first crop circle with the symbols of the magnetic field, reminding Corridor, has appeared on June, 27th 2007 in England. Condition of danger ETC transmit by parallel arrangement of Earth magnetic fields symbols and symbols of humanity placed on top and on bottom accordingly. As it is known, parallel planes have nothing in common. They never intersect. The symbol of Earth magnetic field – dark and light chessboard floor. The symbol of humanity is presented on the ceiling. This is a road-ray of the dark and light stripes. 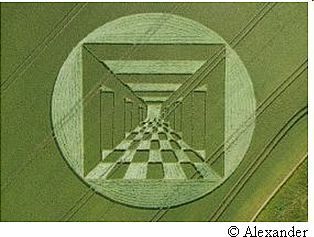 The road-ray was represented in the crop circle in England, 8 July 2006 named by researches the Phoenix. Later, two the same roads-rays were shown in crop circle on the fields of England 16.07.2007 reminding the Butterfly. On both sides of the Corridor ETC show the interaction between these two planes, in one of which is presented our life. Walls of the Corridor have three niches between columns. By 3D image is shown their growth. Three digs-niches mean three cataclysms. These are preliminary cataclysms and they will grow from one to another. After preliminary cataclysms very shortly global cataclysms will come. They are represented by chessboard floor. By this pictogram ETC show that already today we are at the threshold of the first pre-cataclysm. Two others will happen in a short period of time. ETC confirm that mankind has the only one exit from this critical situation. It is the Transition to another safe level of material world. This Transition to a new cycle of life can be made through the consciousness unification. This information is shown by expansion of individual cell brain area presented in the centre by a dark square. A brain area expansion prolongs until the large dark circle which enveloped inner content. The expansion of brain area means the transition of consciousness from individual to united. The crop circle «Pyramids» has appeared also in England on July, 18th 2007. In this crop circle ETC by compass symbols approximately pointed places in the world where each of three pre-cataclysms will happen. Digs in pyramids show approximate mankind losses in each of pre-cataclysms. This pictogram consists of three pyramids. Each of pyramids reveals the consequences of one of three pre-cataclysms. Complete pyramid with a square basis represents population of Earth before the first pre-cataclysm. This primary quantity of people – 6.8 billion lives on Earth today and corresponds to 100%. Mankind losses in each of three preliminary cataclysms represent digs in pyramids. The small dark square placed inside of each dig is a pointer of the whole population of Earth. ETC have chosen a pyramid with the square basis as a figure revealing mankind’ losses because a square underlines the fourth level of mankind’ consciousness. 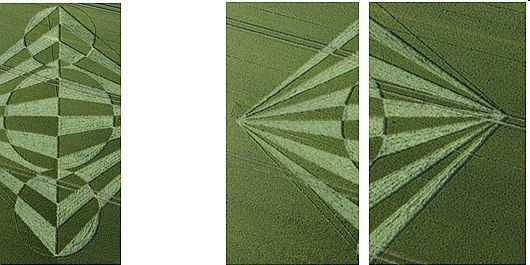 The information cell of our civilization with a square inside has been presented in the crop circles which have appeared 1 August, 1997 and 2 July, 2000 on fields of county Wiltshire in England. Central big pyramid present people losses in the first pre-cataclysm. These losses are not so big comparing with the next two pre-cataclysms. However, the quantity of people losses during a few minutes amazes. This number is very simple to count. Such losses did not cause any even the most severe natural disaster. It is difficult to imagine the strength and scale of this catastrophe. The bottom figure reminds the Г-shaped course of a chess horse and is not looks like a pyramid at all. This is a presentation of Earth population after the third cataclysm. They are "lucky beggars" who will survive in all three preliminary cataclysms. After third pre-cataclysm on Earth will be usual clear sky and survivors of the immense natural disasters, will finally sigh with relief. But not for long time… ETC warn that this breath will be very short. Begun shortly global cataclysms will quickly destroy the last remnants of a once great civilization of Earth – people who have not been able to share something… This is completely inexplicable, because unification of consciousness for the Transition did not affect anyone's private property. Presented by ETC huge digging are not just abstract losses. These are our family and friends. Incredible suffering, pain, tears and sorrow. The dark squares in the center of each pyramid are so similar to letters of the death notice. Millions and millions of not send and not received... They are the result of today's stubbornness, selfishness, shortsightedness. No genofund, – confirm ETC. The goal of started cataclysms is to destroy the surface of our planet to the ground –mountains will turn into piles of sand. Deep processes will gradually soften the inner structure of the planet and turn it into a gas giant planet that has no solid surface. On the planet will arise and amplified winds which speed will gradually reach more than 2.000 km/hour. Together with constant atmospheric formations – huge whirlwinds, they will inflate the remnants of our planet in the universe. An example of a huge whirlwind is constantly observed for over 300 years the Great Red Spot on Jupiter, covering a huge territory several times exceeding the sizes of Earth. That's what means the transition of Earth from the category of «planet of present development of consciousness» to the category of «planet of past development of consciousness»... Today, different phases of this process of planets destruction present gas planets. The beginning of this process shows Mars. This, meanwhile terrestrial planet, after a while becomes a gas. Here that transition of a planet the Earth from a category means «planets of the present development of consciousness» in a category «past planets»… Today different phases of this process of destruction of planets are presented by gas planets. The beginning of this process shows Mars. This, an earthen planet, becomes after a while gas. Such is regularity of Solar system planets development on three last planets of which evolution of advanced consciousness of human being is provided. So, it is impossible to change anything. ETC in crop circles transmit that our consciousness have already completed the cycle of development, corresponding to a planet with the given parameters. Thus, the ETC informed that we are delayed and have already to start the next cycle – Correction. The cycle of Corrections will also be held in harmony of Earth. ETC convey that for the highest consciousness of human being, just finished a cycle of development there is the only one way for salvation from cataclysms. We are young civilization, and this path is unknown to us. That is why ETC help us to make the first Transition in the next cycle of life. In thousands crop circles and different objects of system of information transmission, created in all parts of Earth, ETC reveal the unknown possibilities of our consciousness. ETC report that the united consciousness raises an action. 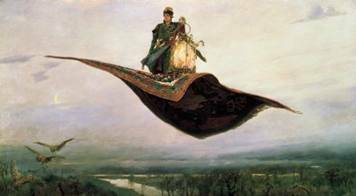 This action is the magic wand, the magic carpet which will carry us to other lands in the fairy kingdom – to another level of the material world. It is so simple – confirm ETC! ETC already in advance knew development process of Earth. They understood that at certain time when consciousness of living there civilization reaches the highest level, on the planet would begin global cataclysms of its destruction. At this moment Earth would fulfill its role in the development of higher consciousness. It is possible that ETC regulate random process of magnetization jumps formation. They form from numerous chaotic jumps of magnetization three big jumps which will cause three preliminary cataclysms on Earth. According to this scheme ETC have created on Earth the greatest complex of a pyramid Giza-Sphinx. The huge sizes of this complex and improbable height of the Cheops pyramid have made it world famous. Moreover, the pyramid of Cheops has passed through multithousand history of mankind and has been recognized the main miracle from Seven Wonders of the Ancient World. 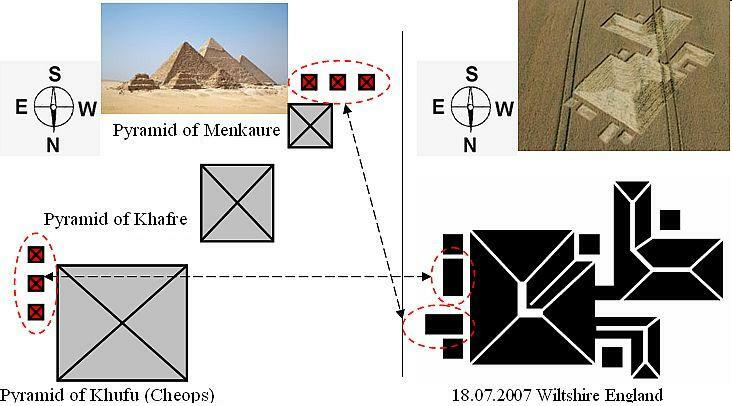 Researchers and scientists have paid attention that in this complex two groups of small pyramids are located in mutual-perpendicular directions and are compasses-symbols. One group of small pyramids located near the greatest pyramid – Cheops (Pyramid of Khufu), represents the North-South direction. Other group – near the smallest pyramid of Menkaure, specifies the West-East direction. It is unique object which has been created by ETC on Earth with the indexes defining its position in space concerning parts of the world. So, small pyramids – compass-symbols in the complex of Great pyramids specify the four cardinal directions. Some millennia later on July, 18th, 2007 on field of England arises the crop circle of extreme importance. It informs mankind living on Earth about a place of occurrence of three preliminary cataclysms and losses in each of them. In this crop circle are also presented three pyramids and compasses-symbols. In this crop circle compasses-symbols are presented by two small mutual-perpendicular rectangles to the left of the greatest pyramid. They show the four cardinal directions. The place on the planet where will happen each of three pre-cataclysms, shows the location of corresponding digging. Comparison and combination of these two pictograms elements allows determining places of each of three preliminary cataclysms occurrence. First two cataclysms will occur in Southern Hemisphere. Thus, the first of them will occur in the Brazilian Magnetic Anomaly from outside Peru, at the intersection of Humboldt current, with El Ni?o, due to the shift of tectonic plates. This information reinforces the position of the ozone hole over Antarctica. The second pre-cataclysm will spread over considerably larger territory, including the North America. The third pre-cataclysm will be the strongest. After it only a part of East Siberia territory will be left. ETС in their autobiography in crop circles inform that they have repeatedly observed the beginning of global cataclysms of planet destruction. The process they have seen in different galaxies. They help young civilizations to make their first transition to the next cycle of life. Their purpose is not star wars, but the unity of consciousness of the universe. Unification of mankind consciousness is not a new event. Today there are examples when big groups of people in the same moment synchronously unite consciousnesses with the uniform purpose. For example, collective prayers, meditation, International Children's Day etc. Earth Hour is a global event organized by WWF (World Wide Fund for Nature). Under the arrangement households and businesses to turn off their non-essential lights and other electrical appliances for one hour to raise awareness towards the need to take action on climate change. Association of consciousness of many millions people around the world has occurred on September, 11th 2001, when as a result of terrorism there was a collapse of two twins-Towers in New York, and thousand people died. ETC specify that mankind should not wait approaches of global cataclysms. Immediately after the first preliminary cataclysm it is necessary to make the Transition to the Highest level of the material world. With this goal all civilization has simultaneously to unite consciousness. ETC warn that after the second preliminary cataclysm it will be already impossible to make the Transition, because the action of the united consciousness of remained people will be insufficient to start the mechanism of the Transition. To unite consciousness of civilisation for Transition is so simple – confirm ETC – especially this association will not affect nobody's private property.